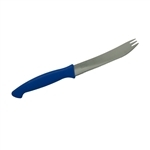 This Everest left-handed stainless steel steak knife is made in Europe, ensuring the highest possible quality. It has a 4.5" serrated blade and is dishwasher safe. Handles are blue soft grip plastic. All Everest left-handed knives are specifically sharpened, scalloped, or serrated on the right hand side of the blade to allow a clean straight cut with the left hand. To ensure longevity of the stainless steel, dry immediately after washing in the dishwasher - or better yet, hand wash and dry. Knives come with a lifetime guarantee against faulty workmanship or defects in materials. Guarantee is subject to correct usage and cleaning. I had no idea my lefty needed a different knife and was puzzled as to why she was still struggling with this skill. I read a book and learned that so many things I never even thought of were effected for her, knives being one of them. Bought this knife and found out just how well she could cut when given the right tool. I’m glad to have found serrated knives that actually cut. Wish they were not blue-handled, but maybe that will turn out to be an advantage- the right-handed people in my life will recognize them and use other knives in the drawer. This was the first time I ordered an item from Lefty’s, their customer service has been excellent.